Bob Evans Restaurant: Free breakfast with the purchase of one breakfast (print first) [9/28]. Boston Market: Free family dessert with the purchase of a family meal (print first) [10/17]. Buca di Beppo Italian Restaurant: Free lunch item with the purchase of one lunch item (print first) [9/21]. Chili’s Grill & Bar: Free chips and queso with the purchase of an entree (print first) [9/23]. Einstein Bros. Bagels: Free bagel poppers with the purchase of a drink (print first) [9/24]. Einstein Bros. Bagels: Free egg sandwich with the purchase of one egg sandwich (print first) [9/24]. First Watch: $2 off an entree (print first) [10/2]. Friendly’s: Their nine for $9.99 deal buys you an entree, drink, and dessert for under $9.99 [expiration unknown]. Maggie Moo’s Ice Cream and Treatery: $1 off a medium or large creation (print first) [9/30]. Marble Slab Creamery: $1 off a medium or large creation (print first) [9/30]. 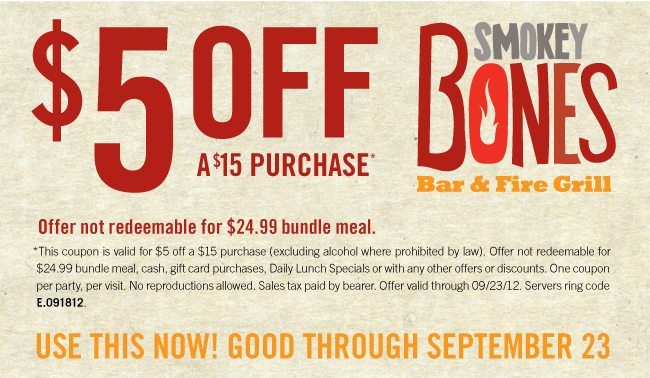 Smokey Bones Bar & Fire Grill: $5 off a $15-plus purchase (print first) [9/23]. White Castle: Free 16-ounce coffee with any purchase (print first) [10/31].